True champion vs champion "superfights" in the UFC are quite rare - Conor McGregor, who was the defending Featherweight champion at the time, moved up to fight Eddie Alvarez for the Lightweight title, while Georges St. Pierre and BJ Penn battled for the Welterweight title back in the day. It's quite rare when two current champions fight each other but that is what will be happening at UFC 226 in July, as Daniel Cormier will be moving up to Heavyweight to take on Stipe Miocic. In reality, this likely signals the end of Cormier's run at Light Heavyweight, as he has already signalled that he plans on retiring in 2019. With friend and teammate Cain Velasquez looking to reclaim Heavyweight gold, Cormier may very well drop both titles if he beats Miocic in July. Daniel Cormier fought the first part of his career at Heavyweight, so this won't be anything new for him. The interesting question will be how much size Cormier feels that he needs to pack on before the fight and what this might do to his speed and timing. 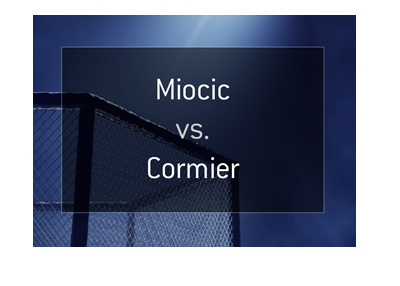 Cormier certainly has the power to knock out Miocic (Cormier has knocked out plenty of Heavyweights over the course of his career), though Miocic has strong wrestling and tremendous power. Cormier will need to be very careful or else he could find himself looking up at the lights in Las Vegas in July. Cormier's path to victory will likely come via his wrestling, as he certainly has the pedigree to win a fight over Miocic on the ground. That being said, Miocic is strong and is not easy to hold down. Miocic, on the other hand, will be looking to unload on Cormier and keep the fight to the outside, where he will benefit from his power and his quickness. This is a fascinating fight and a perfect tilt to build the mega UFC 226 card around.